World’s largest medical center takes a giant leap. There is so much news coming out of Texas medical institutions that any one news item seems difficult to top. In February, the Cancer Prevention and Research Institute of Texas (CPRIT) awarded research and prevention grants totaling $73.5 million toward the fight against cancer. That puts CPRIT past the two-thirds mark in the state's 2007 constitutional commitment of $3 billion to fight cancer. Texas Children's Hospital took the No. 4 spot in the 2017-2018 U.S. News & World Report ranking of children's hospitals. One of only 10 hospitals on the U.S. News Honor Roll, it is the only Texas hospital and the only Southern hospital. In subspecialties, Texas Children's took the No. 1 spot for cardiology and heart surgery; No. 2 place for pulmonology; and 4th for cancer, gastroenterology and GI surgery, neurology and neurosurgery, and nephrology. Texas Children's, the world's largest children's hospital, along with M.D. Anderson Cancer Center, the world's largest cancer center, both are part of Texas Medical Center, the world's largest medical complex, which treats 10 million people annually. Such accolades seem tough to top. But, top them, they did. 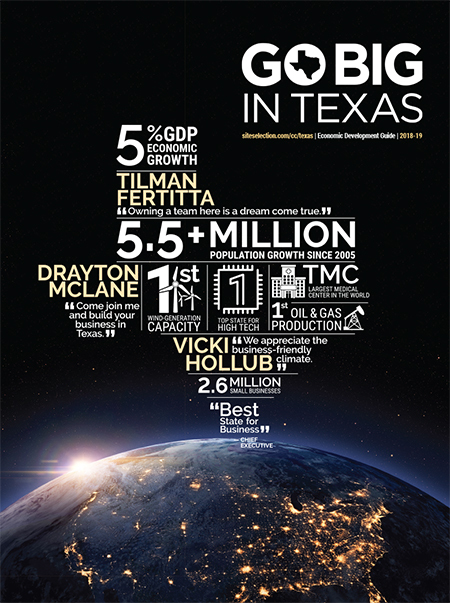 In late April, Texas Medical Center announced the official kickoff of its new, state-of-the-art campus known as TMC3. The 28-acre campus, to be built in a double helix design right in the middle of the enormous Texas Medical Center, has a Texas-sized goal of creating a translational research cluster co-located with life science industry expertise. The secret to attaining these lofty goals, says William F. McKeon, Texas Medical Center president and CEO, is collaboration. "It's probably the most transformative project in the 70-plus-year history of the Texas Medical Center. It will serve as the cornerstone for our collaborative work to be done on this campus, which is really the new wave of working together. Gone are the days where institutions just worked by themselves." Historically, McKeon says, when one of the Texas Medical Center institutions wanted to expand they would come to the CEO's office and request a grant of land. "We'd grant it to them, and they'd go and build, say, a separate MD Anderson research building," he says. But this time around, McKeon explained, when member institutions of Texas Medical Center came requesting land, "We said, 'Why don't we think about building a collaborative campus so that you can actually share those expensive resources?' It was really about having our researchers who are all looking at genomics — they're all looking at new drugs or new therapies — why not put them on one campus where they collide in the morning over breakfast, in their labs and having a glass of wine in the evening in the park on top of all of this?" The campus will include, in addition to these collaborative labs, a hotel and conference center, retail, restaurants and the park. That means, McKeon says, that these researchers who are accustomed to working on their own actually will "bump" into each other in the course of a day. Perhaps these chance meetings will occur in the park, which McKeon says will be "highly programmed with tai chi and yoga and meditation and wine gardens and bocce courts. It's going to be a great asset, not just for the medical center but also for our community. "We really believe that with this incredible opportunity with the largest amount of minds dedicated toward advancing health, that to bring them together on this iconic campus will forever change the way in which we conduct research. "Imagine now not just sharing a campus of labs, but now sharing our data so when we look across 10 million patients and apply genomics and a lot of our advanced technologies here that we're really using this as a Petri dish to advance care." One more unique feature of TMC3 is that for-profit labs will be welcome. Historically, covenants prevented the land within Texas Medical Center from use by for-profit institutions. For TMC3, the covenants were changed because, as McKeon says, "We want the J&Js, the Medtronics, the GSKs to be there, and we have sites for them right next to our researchers, so it won't just be our researchers, it will be some of the leading pharmaceutical, medical device and digital technology companies in the world side by side with our researchers." This concept, McKeon says, is about the boldness of leadership, looking beyond your own brand, your own organization to think about how things will operate in the future. This is one Texas-sized idea that is about to become a reality.